Some may think Super Overlays are cool, but you can do the same in World Wind by just dragging and dropping georeferenced imagery. The tiles are built using the windows version of the same tool that tiles the imagery on the server. A simple front end figures out what options you will need to add the imagery and produces a corresponding xml. The tiling takes some time to build to full resolution, and reproject. For instant gratification I am considering doing a quick thumbnail of the reprojected image and loading it as an Overlay. 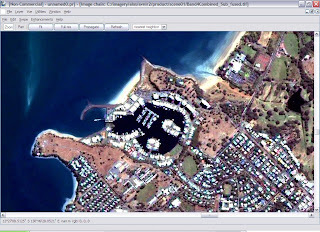 This will also allow georeferencing by hand of ungeoreferenced imagery. Most of the heavy lifting is done by the GDAL C++ API which are used in Dstile. I am planning a migration to the C# bindings as they mature. I have been tic-tacing with the Kyoto and Carbon science team to bring their PALSAR mosaics to World Wind. At one point there was a note that World Wind has no support for KML. So I made a KML Ground Overlay with one of the Jers Mosaic scenes available at the GRFM(Global Rain Forest Monitoring) Site. The kml can be found here. It works fine in both Google Earth and World Wind. World Wind does not have extensive support for KML, but to say it has no support is a fallacy. There was some discussion on the mailing list about this too. I am planning to get all the free JERS data from GRFM and serve it via World Wind , even if it is just to prove a point. The best and broadest user reach can be obtained through hosting a WMS server which is supported in a lot of viewers. So Friday night out after more work. This time we started with dinner, watching belly dancing and smoking shisha in a Lebanese restaurant. Then moved onto CJ's with a fantastic live band playing latin music and lots of gorgeous people. I am going back tomorrow. Need to manipulate situations so that I get to come back. I have been bouncing around Asia quite a bit these days. I was flying Singapore Airlines on the 14th which also happens to be my birthday. Work had set quite a surprise for me , they had a cake ordered for me on the plane. I walked through check-in and immigration being wished happy birthday at every step. 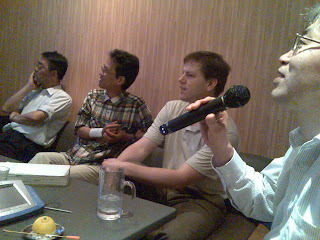 Had quite a bit of fun once in Jakarta as well. Went with a few friends Fabrice has made while there to Aphrodite. More nights of action in Jakarta coming up. Finally managed to get away for a day to loiter about in Tokyo. Started in Akihabara again. Passed by Ginza and the Kabuki Theater. Got to go there for a show sometime. Finally ended up in Ruppongi hills with panoramic view of the sprawl of Tokyo. Mori museum and the Tokyo city view are good counterpoints. The current exhibition shows some Japanese Scrolls and Panels of life in Japan as it used to be an looking out of the balcony you can see Tokyo as it is now - a river of light. Back to Jakarta in a few days hardly any time to breath. Of course I would be doing JAXA a discourtesy if I did not include some of their very nice and affordable 2.5m product here. The second day of conference is nearly over. I have done my presentation with usual flourish and some colourful SAR images. Then I went to Tokyo-Akihabara with Kostas from DLR. Spent some time admiring the lights and trying all the ATM's in sight. I was feeling rather poor , till I realized the only international ATM's are the Post Office - something to be really careful about next time I am in Japan. There was some interest in using World Wind to display imagery from a Global PALSAR mosaic built up every 4months (Over land and cloud free - it's SAR !!) from the Kyoto and Carbon initiative. They have been fiddling with Google Earth since that's all they know off but World Wind can push in on this, since adding all the KML's to show imagery in Google is a real pain. Hope we can attract the Scientific community on the Envrionmental and Global Warming issues more with this data. Finally I am at my destination. After flying around for 13 hours. The time difference is only abut 1 hour from Adelaide but it is winter instead of summer. It is getting warmer in Tokyo though, nearly spring. Tsukuba Centre is about an hour train ride from Akihabara. It has got quite a few science and research setups and a giant rocket overlooking the city. I did the first two things i had to do: went on a Manga shopping spree and got the latest chapters of Bleach and had as much Sushi and Sashimi I could handle. The eel tastes the best. Finally I am on the long awaited trip to Tokyo. So I decided to go wild on the friday night before. Plenty of people in town for the Adelaide Clipsal 500 and showgirls in plenty. I went off with a random group of builder and had heaps of crazy fun. Talked to a showgirl about Freud and Oedipus complex, she is first year psyche. It was quite refreshing. Finished off dog tired dancing at Sugar - with girls pulling me around, and aggressive guys threatening to throw me out. Barely got out of that one ... Phew! Now on the long flight to Narita. See you all on the other side.